Star Trek Las Vegas 2018 confirmed a huge piece of news for the Trek universe last weekend: the rumours were true, and Sir Patrick Stewart would be returning to television to reprise his role as an older, wiser Jean-Luc Picard in a new Star Trek series. We know little else about the series beyond that, but I really hope it does for Picard what Star Wars: The Last Jedi did for Luke Skywalker. That sort of hoping might rankle longtime Trek fans. In fact, many of them have spent the last few days desperately hoping for the direct opposite of Star Trek: The Last Jedi. They’ve read Stewart’s own statement that the new show’s Picard would be a “man who has been changed by his experiences” and shuddered at the mere thought of a disillusioned, weary Picard roaming around an isolated family vineyard swigging freshly-squeezed Targ milk. They’d already had to go through one traumatic fictional upheaval, why wish that on another old hero? Why can’t Picard just be the Picard we saw in TNG and the movies? Because that would be kind of boring, for starters. As someone who loved the deconstructionist bent of The Last Jedi, and especially the way it brought Luke’s journey to an end, I’d love the new Picard series to do something similar. Not directly literal of course – Jean-Luc doesn’t have to pass on at the end of it, the way Luke quietly dissipates into the Force in The Last Jedi. But in terms of having heroes who so wholly represent the greatest ideals of their respective franchises go through a trauma that leaves them challenged and conflicted, a conflict that lets them grow and develop as deeper characters, while reminding us of the grand ideals they represent? Hell yes. Especially because this new Star Trek show has another fascinating opportunity it can’t waste: it’s set 20 years after Nemesis (so 2399, fact fans), which means it’s the farthest into the future of the main timeline a Star Trek TV show has gone, our first “canonical” imagining of the Star Trek galaxy previously only touched on in novels and Star Trek Online. But it also means it’s set about 20 years after one of the most cataclysmic events that we know of in the Star Trek timeline: the Dominion War. A post-Dominion War-era Jean-Luc Picard in Star Trek: Nemesis, pulling face you’d pull if you had to star in Star Trek: Nemesis. What Picard and the rest of the TNG crew went through during the war is relatively unknown – some of the non-canon Trek novels covered the Enterprise-E’s role in the war, and the closest we have otherwise are Insurrection and Nemesis, movies that are set in the years just after the conflict but also, understandably, had their own threats to deal with. We don’t get the time to see how these characters are changed by a conflict that rocks Starfleet and the Federation to the core – that shakes the moral foundations that a captain like Picard not only holds dear, but in the eyes of many Trek fans, is practically the living embodiment of them. Twenty years is a decent chunk of time after the end of the Dominion War for Jean-Luc to be removed from the initial chaos of the conflict (if we’re keeping our Last Jedi comparisons rolling, Luke only spent up to six-ish years in exile after his Academy’s destruction) to reflect if the Federation that exists in 2399 is still the idealist utopia it was before one of the bloodiest wars in its history – and if he himself can still live up to that ideal. 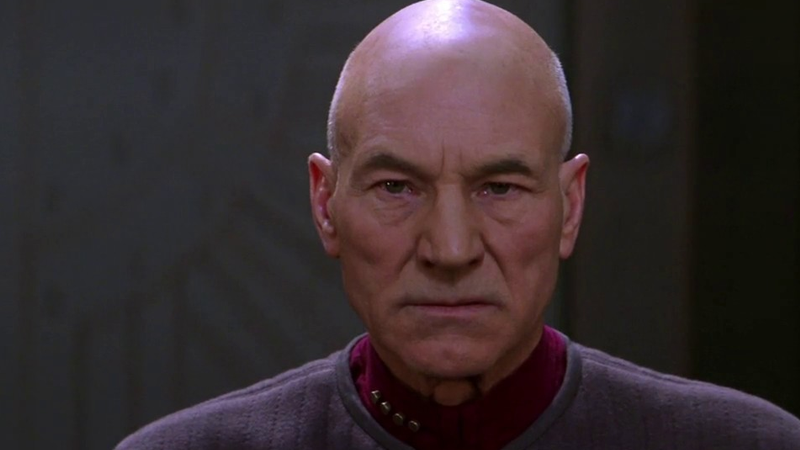 Because really, unless the reason this new Picard is different is because he’s a completely different man altogether, isn’t that sort of moral questioning something the Jean-Luc Picard we know and love would go through in the wake of an event as earth-shattering as a full-scale interstellar war? It’s not like Star Trek hasn’t put him through the moral wringer in the past – challenging the ideals the Federation holds dear is what the franchise does at its best. Part of what makes Picard one of Star Trek’s most adored characters is that no matter the situation, his moral core never wavers. And it’s not like Trek hasn’t used war to really bring his moral conflict to the fore before, either – First Contact’s most defining moment comes when Jean-Luc teeters on the edge of letting his urge to get vengeance on the Borg overwhelm him, the moment we get to see him so close to falling from that moral centre. A new show has a chance to bring that moral debate to the forefront again – give us a Picard that, so deeply shaken, perhaps did falter for a while, only to have to go through finding himself again, whether it’s through introspection or seeing hope in a new generation of Starfleet heroes after him, as Luke did with Rey. There could be nothing more affirming of Trek’s long-held ideals than seeing their greatest champion stray from the path, be horrified by that, and inevitably return to it. And wouldn’t that be a much more interesting journey to experience than Captain Picard doing the same old thing he was doing decades ago, with nothing changing but the impossibly rare wrinkle on Patrick Stewart’s astonishingly timeless visage? But yeah, we can probably skip the fresh Targ milk swigging. That might be a bit too much.